St Anne's is committed to safeguarding and promoting the welfare of children and young people and expects all staff and volunteers to share this commitment. 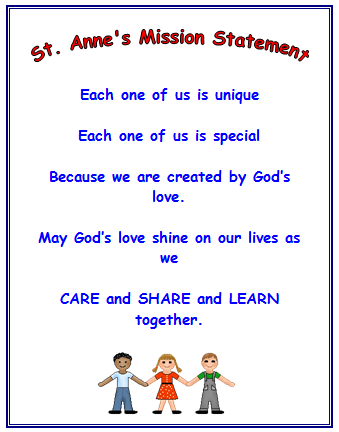 Welcome to the St Anne’s Catholic Primary School! A very warm welcome to you from us all at St. Anne's. Here at our school, we understand that each one of us is unique, each one of us is special and that we are made in the image of Jesus, our friend. We care for each other, we share with each other, we work and play and learn together. We hope that you enjoy your visit and that you find our school welcoming, interesting and entertaining. We hope to keep adding to and improving our website so that each time you visit there is more to see. Please feel free to leave comments in the Guestbook, the Feedback From Parent's Page or contact the school direct with any queries you might have.